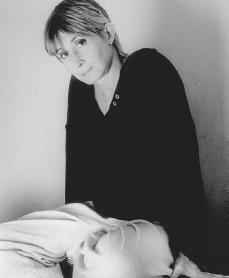 Twyla Tharp was born in Portland, Indiana, on July 1, 1941, the daughter of Lecile and William Tharp. Her grandparents on both sides were Quakers and farmers. She was named after Twila Thornburg, the "Princess" of the eighty-ninth Annual Muncie Fair in Indiana. Her mother changed the "i" to "y" because she thought it would look better on a marquee (a sign outside a theater). Twyla was the eldest of four children. She had twin brothers and a sister, Twanette. Her mother, a piano teacher, began giving Twyla lessons when she was eighteen months old. When Tharp was eight years old, the family moved to the desert town of Rialto, California, where her parents built and operated the local drive-in movie theater. The house her father built in Rialto included a playroom with a practice section featuring a built-in floor for tap dancing, ballet barres (rails used for dance exercises and stretches), and closets filled with acrobatic mats, batons, ballet slippers, castanets (mini-sized percussion instruments that are attached to the thumb and forefinger), tutus, and capes for matador routines. Her well-known tendency as a workaholic and a perfectionist began with her heavily scheduled childhood. Tharp began her dance lessons at the Vera Lynn School of Dance in San Bernardino, California. Then she studied with the Mraz sisters. She also studied violin, piano, drums, Flamenco dancing, castanets, cymbals, and baton twirling with Ted Otis, a former world champion. At age twelve she began studying ballet. She attended Pacific High School and spent her summers working at the family drive-in. Tharp entered Pomona College as a freshman, moving to Los Angeles, California, that summer to continue her dance training with Wilson Morelli and John Butler. At midterm of her sophomore year she transferred to Barnard College in New York City. She studied ballet with Igor Schwezoff at the American Ballet Theater, then with Richard Thomas and his wife, Barbara Fallis. She began attending every dance concert she could and studied with Martha Graham (1893–1991), Merce Cunningham (1919–), and Eugene "Luigi" Lewis, the jazz teacher. In 1962 Tharp married Peter Young, a painter whom she had met at Pomona College. Her second husband was Bob Huot, an artist. Both marriages ended in divorce. Huot and Tharp had one son, Jesse, who was born in 1971. Tharp graduated from Barnard College in 1963 with a degree in art history. She made her professional debut that year with the Paul Taylor dance company, billed as Twyla Young. In the following year, at age twenty-three, she formed her own company and began experimenting with movement in an improvisatory (made up on the spot) manner. began to be recognized for the breezy style of dance that added irreverent squiggles, shrugged shoulders, little hops, and jumps to conventional dance steps, a technique she called the "stuffing" of movement phrases. Among the most creative of her early pieces is The Fugue (1970) for four dancers, set to the percussive beat of their own feet on a floor set up with microphones. In 1971 she choreographed Eight Jelly Rolls to music by Jelly Roll Morton (1890–1941) and The Bix Pieces to music by jazz musician Bix Beiderbecke (1903–1931). Tharp performed as a member of her company until the mid-1980s. She stopped dancing to concentrate on her many projects for television and film, as well as for her company. She returned to performing in 1991. Other works for her company include Sue's Leg (1975), Baker's Dozen (1979), In the Upper Room (1986), and Nine Sinatra Songs (1982) set to the music of Frank Sinatra (1915–1998). In 1973 Tharp created a work for the Joffrey Ballet, her first for a company other than her own and her first work for dancers on pointe (on the tip of the toe). Tharp used the Joffrey dancers and her own company in a work entitled Deuce Coupe, set to music by the Beach Boys. Teenage graffiti artists created the setting on stage each night. It was a huge success. Tharp then went on to create As Time Goes By (1973) for the Joffrey; five works for the American Ballet Theater, including Push Comes to Shove (1976) and Sinatra Suite (1984), both with leading roles for Mikhail Baryshnikov (1948–); Brahms-Handel (1984) in collaboration with Jerome Robbins for the New York City Ballet; and Rules of the Game (1989) for the Paris Opera Ballet. Tharp's work for her own company and for the ballet troupes made her among the first to demand a "crossover" dancer, one who would be equally at home in ballet and modern dance technique. With the success of Deuce Coupe, Tharp was in demand everywhere for her irreverent, funky-look choreography that appealed to the widest array of audiences in the United States. Tharp made her first television program for the Public Broadcasting Service (PBS) series Dance in America (1976). She continued in television with Making Television Dance (1980), Scrapbook Tapes (1982), The Catherine Wheel (1983) for the British Broadcasting Corporation (BBC), and the television special Baryshnikov by Tharp (1985). Her film work began in 1978 with Hair, followed by Ragtime (1980), Amadeus (1984), and White Nights (1985). Tharp directed two full-evening productions on Broadway: The Catherine Wheel (1981) and the stage adaptation of the film Singing in the Rain (1985). By 1987 Tharp was forced to disband her company because raising money to keep her dancers on salary was getting difficult. She was also interested in various other projects. She was invited to join the American Ballet Theater as artistic associate with Baryshnikov. When he departed the American Ballet Theater in 1989, she left as well, taking her ballets from the theater's repertory (the works regularly presented by a performance company). After that her works were presented by the Boston (Massachusetts) Ballet and the Hubbard Street Dance Company, based in Chicago, Illinois. After leaving the American Ballet Theater, Tharp embarked on a variety of endeavors that kept her in the forefront of American dance, including an autobiography (a book written by oneself about oneself), Push Comes to Shove, published in 1992; a series of tours with pick-up companies of dancers recruited mainly from the ballet troupes where she had worked; and a new work for the Boston Ballet, which premiered in April 1994. Tharp continued to tour nationally and internationally with her assistant, Shelley Washington Whitman, often working without a company of her own or a permanent support base. In 1996 she choreographed Born Again, a trio of new dances. They were performed by a group of thirteen young unknown dancers, who were selected in a series of nationwide auditions and trained by Tharp and Whitman. She returned to the American Ballet Theater in 1995 with successful revisions of two recent works, Americans We (1995) and How Near Heaven (1995), and a new work, The Elements. In 2000 Tharp choreographed a new work for the New York City Ballet based on Beethoven's (1770–1827) seventh and eighth symphonies. In 2001 Tharp made the Lafayette Presbyterian Church in New York City the permanent home for her company. This was her first permanent base in her thirty-five-year career. Tharp is the recipient of many awards, including a creative citation in dance from Brandeis University (1972), the MacArthur "Genius" Award (1992), and five honorary (earned without completing the usual requirements) doctorates. She has established her own unique style, combining various dance and musical styles. Livet, Anne, ed. Contemporary Dance. New York: Abbeville Press, 1978. Rogosin, Elinor. The Dance Makers: Conversations with American Choreographers. New York: Walker, 1980. Tharp, Twyla. Push Comes to Shove. New York: Bantam, 1992.